A few months ago I visited the recently opened Guangzhou Opera House, designed by renowned British-Iraqi architect Zaha Hadid. The project represents a new era in cultural development for Guangzhou and China. Drawing inspiration from the adjacent Pearl River, the project is conceived as ‘pebbles in a stream smoothed by erosion’. Guangzhou (0nce known as Canton) is one of China’s great cities, with a long history and unique culture. Sitting in the Pearl River Delta, the city was once China’s gateway to the world, serving as the country’s primary hub of international trade. 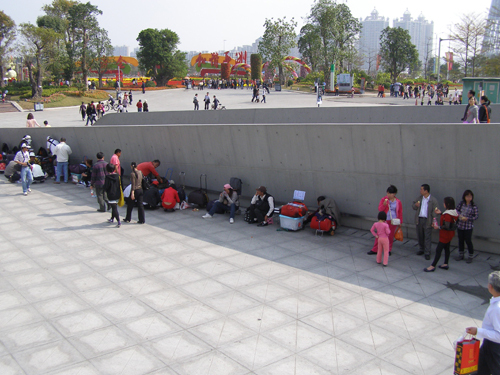 Today Guangzhou remains an important city as it is the capital of prosperous Guangdong Province. Yet as China has developed in recent years, Guangzhou has ceded some of its historic luster. No longer is Guangzhou China’s gateway to the world as nearby Hong Kong has taken that title. The special economic zone of Shenzhen, also nearby, dominates international headlines with its rapid development and status as China’s symbol modern prosperity. Yet what Shenzhen and Hong Kong lack in culture, Guangzhou makes up for with its proud sense of the past. 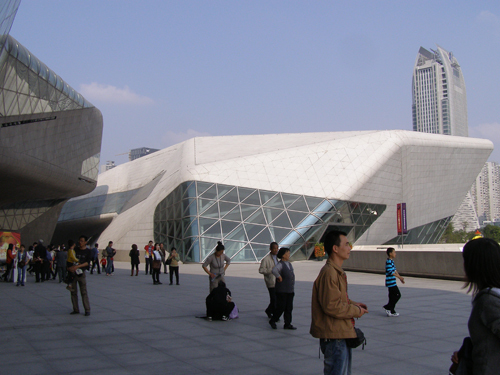 The opera house is an attempt to regain some of its cultural dominance in southern China. The Guangzhou Opera House is also characteristic of recent developments in international avant-garde architecture- that is, exploring irrational forms as a reaction to the Modernist paradigm of Cartesian geometry. Dubbed parametricism by Patrik Schumacher, a director at Zaha Hadid Architects, this new style seeks to ‘fight stylistic pluralism’. Translated into English, this roughly means that because globalization has reduced architecture’s role as a communicative device, architects and their clients are free to explore whimsical forms detached from time and place. The Guangzhou Opera House is significant because it is one of the first parametric buildings to be realized in built reality. Because building this kind of structure comes with a hefty price tag, Hadid was fortunate to have a client, the Guangzhou government, who wanted to make a bold statement and was willing to spend the money to do so. The opera house sits in Guangzhou’s central business district among newly built skyscrapers and wide boulevards. There are no traces of history in this part of the city, making the site a perfect tabula rasa for the unconventional structure. Other than a few patches of grass and a reflecting pool, the plaza and immediately surrounding area is devoid of landscaping. This makes for a rough environment with no respite from the harsh south China sun. The lack of landscaping and even outdoor seating areas is by design of course, leaving the opera house to be viewed as a pair of objects without visual obstruction. The project consists of two separate buildings, both clad in triangulated granite panels – one grey and one white. The grey building contains the main opera house, as well as practice rooms and a grand lobby space. The white building houses smaller theater for non-opera performances. Because of the irregular shape and complex polygonal cladding system, the exterior finish of the buildings look clumsy. In several places on the façade, joints do not line up and panels crumble off the wall. Architecture critic Nicolai Ouroussoff noticed this as well in his review of the project for the New York Times. Yet whereas Ouroussoff attributes the poor quality of construction to the lack of skilled labor in China, I contend that it has more to do with the convoluted shape of the buildings and lack of rigorous detailing in the architectural drawings. It is inaccurate and even biased to suggest that China is completely devoid of skilled labor. Yes, it is true that many buildings are hastily built in the rush to modernize, but there are also examples of projects in China built to a high standard. One only needs to look at the adjacent skyscrapers to the opera house to see the kind of quality that is attainable. Though the exterior of the building is less than impressive, the entry hall is truly unique and captivating. The fluid dynamic of the space is classic Hadid and acts as an otherworldly transition from outside to inside the main performance hall. It is also inside the entry hall that the space frame structure is appreciated in its full complexity with its structural members exposed. Consistent with the outside, the performance hall is also fluid in form. The hall is big with 1,800 seats but doesn’t feel too large as to be overwhelming. The ceiling, dotted with hundreds of small lights, mimicks a starry night sky. Despite the overall hubris of the project, the performance hall is comfortable and welcoming. 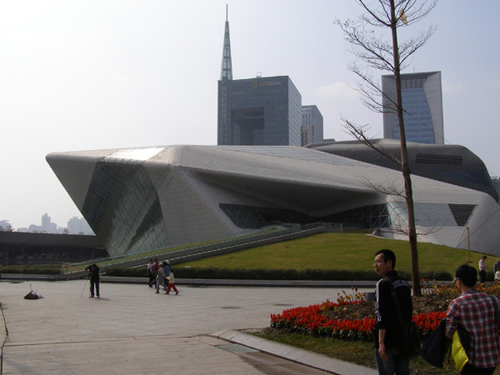 As a piece of architecture in a larger urban context, the Guangzhou Opera House is self-referential and anti-urban. This is most likely due to the inherent nature of parametric architecture which is generally an exercise in form devoid of context- meaning that this type of building could emerge anywhere in the world. It just so happens that Guangzhou, at this moment in time, had the ambition to build such a project. As a performance space, the opera house is unmatched in its novelty. When one attends an opera or any other kind of live theater performance, the intent is to escape the realities of daily life for at least a couple of hours. The Guangzhou Opera House, with its transcendental interior space, does an excellent job of facilitating this. Cycling in Hong Kong: Mission Impossible?